Dear Fabulous supporters and Friends of The Noakes Foundation & Eat Better SA! Another amazing year has come and gone for all things low carb and we are ready to close for a short summer break to recoup before an even more eventful 2018 that is looming fast ahead of us! A year-end wave, deep bow of gratitude from me and the team TNF to thank you for your support, interest, passion and mostly, for changing your own lives, one good family meal and shopping trip at a time. This has been an astounding year of progress at casa TNF and Eat Better SA! with all our programs stepping into a new level of growth and maturity. Perhaps one of the many most important things we have learnt from the seemingly never-ending HPCSA enquiry Prof Noakes and his family and colleagues have weathered in good spirits in the past years has been that we know who our friends are for sure now. We also know for sure that there is insufficient guidance, mentorship and education on lifestyle in the current medical training on many levels. 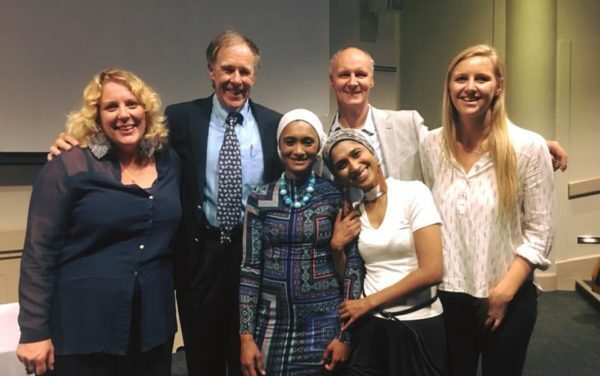 Doctors, nurses and a few brave dieticians from all over the world have stepped forward and approached us and Prof Noakes seeking solace in this story that dis-acknowledges the mind-body link between human diet, lifestyle and chronic disease in medicine. We have taken their pleas and the mass outreach of support on as a calling and a mission to collaborate, network and connect like-minded pioneers into what is now called the Nutrition Network. We have done this to help and educate in a way that helps the average person manage their life and health better. More overwhelming than the enquiries from other docs and scientists is of course, the inbound need for advice from patients and the public. When I started at TNF and realized the tens of thousands of emails, facebooks and letters that had been sent to Prof since he came out of the low carb closet, I was astounded. Why were all these people coming here for help and why was he stepping up in this brave way wherever he could: Twitter, email, talks all over the world etc? He was meant to have retired! It was soon obvious: because nobody else was brave enough to! The public was and still is knocking on doors they can, desperately trying to make sense of the nonsensical health pictures they are struggling with that make no sense and defy logic in some areas. Having followed convention and advice very well for a few decades myself and ending up sicker, I knew the story all too well and understood it. The truth is, people are desperate for experts that understand and join the dots and, until now, there has been a deficit of these experts for us to refer people to. The public in South Africa has revolted and simply taken its health into its own hands and done an excellent job of it so far! By the end of next year, we will have a strong and growing network of medical professionals that we feel confident to refer people to that understand the science and will be able to give balanced informed advice on LCHF and Ketogenic science! Medical professionals that were seen as renegade for offering dietary and lifestyle advice instead of pills and pharma solutions, are being given a voice and a chance to be together and train up in this area with practical ways to implement and practice dietary advice through our new project that ties into some other global projects doing equally critical work. We know for sure that many of our docs currently eat low carb and live this lifestyle themselves and for their families, but its been these same doctors that are afraid to offer this advice in their practices: guideline guideline guideline is the buzz word that we and they hear all the time like a scapegoat as resistance to change. The reality is simple and obvious to anyone that takes a walk on the streets of our country or anywhere else for that matter: dietary guidelines need urgent updating, the conversation needs to be broadened and we need to see a better conversation between the medical profession and the customer if medicine is to keep up with the future and with the impending merging of tech into this area. Now is not the time to be sleeping behind the old way of operating as a doctor with telemedicine and a doc in your pocket via Virta Health and so many other innovators coming to a pocket near you yesterday! I personally want to go to a doctor that asks me about my life, stress and who I am outside of their office, rather than one that gives me a list of tests, pills and tells me I am ill instead of exploring the whole picture with me. I am done with that story like millions of others! With this all in mind and with a commitment to a new way of approaching education, I personally attended Professional Training in Mind-Body Medicine in the USA this year and was blessed to meet about 160 medical professionals and a large body of staff who have similar views and values to our team on the ground here. It’s not been easy to find docs with similar values in the past years but suddenly many are stepping out and talking about the changes needed in medicine. One amazing male nurse at my training in San Francisco told me he had left nursing because obesity and dealing with the lifting of heavy patients had put his back out. It was his only reality towards the end: fighting obesity with the muscles he had left to lift and lug patients around beds and in surgical wards and his life as a nurse and healer that he had dreamt of had become hell. Like so many medical heroes that are in a similar cycle of illness management instead of healthcare. A paediatrician told me about her obese kids and how she only had twelve minutes per patient in her clinic but that the computer system and prescription med processes she had to enter took her about nine minutes per person to change. She wants to leave medicine and start teaching groups about lifestyle and mind-body instead as she felt like her life had become a chain of sick kids and a computer she didn’t know how to work, churning out prescriptions as part of some big healthcare deal in the background. She didn’t have time to ask them about their diets, parents, school, lives and avoided looking them in the eye. To say the current state of medicine and our medical professional’s lives and approaches to treatment is dire and depressing is for me, an understatement. So, in Feb we launch our first training in Low Carb diet and at this two-day event, we have an incredible line up of docs and a few other experts that are going to change the game in SA. The course will be available online as a professional training too shortly after the Feb event for those that can’t make it all the way to Cape Town – as if you needed an excuse?! Books published and taken to the world Galore this year! We saw the launch of the Banting Pocket Guide, Diabetes Unpacked and Lore of Nutrition: all incredible game-changing books that exemplify the view of working together in medicine and the treatment of chronic disease. Lore of Nutrition, just out, is the book for your holiday read in my humble opinion – it is Prof Noakes’ story of how he and nutrition went on trial and is co-written by the formidable and inspiring Marika Sboros. All royalties of all the books this year and all of Prof Noakes’ books and talks are gratefully paid to The Noakes Foundation and Eat Better South Africa! We are as always, deeply grateful to him for his support, generosity and boundless energy: I sometimes wonder if he does actually ever sleep at night – we can blame all those ketones and perhaps his recent quite committed commencement at a Crossfit box?! A growing series of amazing talks by the team including talks at: The Livewell Dementia Conference, World Diabetes Day talk at the Bongi Ngema-Zuma Foundation, The Nutrition Network Fundraiser, UCT Kilimanjaro Hike Fundraiser for dialysis machines, the Lore of Nutrition and Banting Pocket Guidebook launches in Cape Town and Joburg, PACIM conference in Stellenbosch, and many many more. Email candice@thenoakesfoundation to book one of our network members for a talk. We conducted a study on how breakfast cereals prescribed to diabetics measure up and what their effect is on blood glucose, compared to a very low carb breakfast. Results out in the first quarter of next year and as expected, astounding yet utterly obvious to those that know this reality. We were blessed to have a series of exceptional grad and post grad interns visit our shores this year, thanks to Karin Cromner and her team at XChangeSA. Last but definitely not least, EAT BETTER SOUTH AFRICA! Took on a new level of growth this year thanks to the support of our affiliates and a grant from Crossfit: we had our two Dutch interns do a study on the sustainability of the programs one and two years post attending. The results, which will be published in the first quarter of next year, are overwhelmingly positive. All participants felt that doing our program made their lives better off and dramatically improved their overall health. I am going to leave it to Mas, our new fulltime Eat Better Champion, to embellish all the highlights in a separate article. There are too many to mention here that I am so unbelievably proud of. As I talk about earlier, next year starts with the exciting and long anticipated launch of the Nutrition Network – a professional training program for experts in the medical and low carb areas. Find out more here and sign up: the live conference is on the 9 and 10th Feb but shortly thereafter it will be available as an online training. Prof Noakes giving a talk at the Public Health Collaboration in the UK in London in May. Click here for more information about this conference. Low Carb USA in July is on the cards again and we will be featuring an all South African Affiliate stand this coming July in San Diego. Click here for more info about the event. I hope all of you are working at resting your mind and stretching your bodies in new ways over the hols. I am planning to spend time at the beach with my family and to climb a few new mountains and break my record at a few older ones and I can’t wait to get next year underway and to see many of you in Feb .